Immunisation is acknowledged by the World Health Organisation (WHO) as one of the most successful and cost effective public health interventions. Active vaccination programs have helped to reduce, or in some cases virtually eliminate, the threat of some of the most dangerous childhood diseases. Screening programmes are a vital tool in helping identify apparently healthy people who may be at increased risk of a disease or condition. Both are crucial in helping to protect the health of the population. This chapter highlights the level of need in the population in relation to uptake rates of immunisation and screening programmes across Surrey; describes the current delivery model across the life course; identifies potential and understood gaps in the current delivery mechanism; and offers a set of recommendations. The national immunisation programme for the UK includes a number of vaccinations recommended by WHO as well as a number of others defined by Public Health England. These differ according to age, need and level of risk. Screening programmes are free at the point of use and available to anyone in the target age groups, irrespective of gender, income and disability. The European Region of the WHO has set a 95% uptake rate for childhood immunisations. Currently Surrey falls short of this target and the national (England) benchmark in relation to cover rates for most childhood immunisations. For example, in 2015/16, average uptake of the Measles, Mumps and Rubella vaccination in Surrey was 82.5% for the first dose and 73.8% for the second dose, compared with an average of 91.7% and 88% in England. Uptake of adult immunisation programmes in Surrey varies across programmes and the health economy – for example, uptake of the influenza programme in at risk groups and health and social care staff is historically low. Across Surrey, coverage rates in the national breast and cervical cancer screening programmes vary and fall short of the national ‘achievable’ targets. Therefore, there is a need to work in partnership to improve the coverage of these programmes locally. Immunisation and screening programmes in Surrey are commissioned by NHS England, with operational and delivery support provided by a specialist Screening and Immunisation team employed by Public Health England. Currently across Surrey, routine vaccinations are primarily delivered via general practice and routine school-aged vaccinations are delivered by specialist community providers in schools. Screening programmes across Surrey are delivered via a range of models and approaches including primary care, community providers and antenatal services. There is a wealth of evidence to suggest that multidisciplinary and flexible approaches are effective in improving uptake of immunisation and screening programmes. For example, evidence highlights the need to embed a whole systems approach to improving uptake and coverage, including improvements to data collection and targeting those most at risk of being unimmunised or unscreened. Improving uptake of immunisation and screening programmes will require contribution and collaborative working by a number of stakeholders and organisations. The recommendations detailed in this chapter are intended to inform operational delivery of immunisation and screening programmes and offers a strategic approach to improving uptake. High vaccination rates are key to preventing the spread of infectious disease, complications and possible early death among individuals and protecting the population’s health through both individual and herd immunity. For example, the World Health Organisation (WHO) estimates that measles vaccination resulted in a 79% drop in measles deaths between 2000 and 2015 worldwide (1). Immunity is the ability of the body to protect itself from infectious disease (2). Vaccination works on an individual by stimulating the immune system to have memory of a specific disease so that they are protected from future exposure to the same disease. The aim of an individual vaccination programme is to offer mass immunisation to eliminate or eradicate the particular disease from the population, or to vaccinate those at particular risk of significant problems due to age, other health problems or other factors that would impact on a person’s ability to fight infection. ‘…. a form of immunity that occurs when the vaccination of a significant portion of a population (or herd) provides a measure of protection for individuals who have not developed immunity’ (3). Currently the European Region of the World Health Organization (WHO) recommends that on a national basis at least 95% of children are immunised against diseases preventable by immunisation and targeted for elimination or control (specifically, diphtheria, tetanus, pertussis, polio, Haemophilus influenzae type b (Hib), measles, mumps and rubella) (4). For many infectious diseases achieving this level will ultimately eliminate it from the population. From 1 April 2013, commissioning responsibilities for immunisation programmes in Surrey transferred from the former NHS Surrey Primary Care Trust (PCT) to NHS England, with operational and delivery support provided by a specialist Screening and Immunisation team employed by Public Health England (PHE). Local authority public health teams have a role to ensure that these programmes are delivered to a high standard and that coverage is adequate amongst the local population. Overall, childhood immunisation rates in Surrey are the lowest in the South East and amongst the lowest nationally. Raising awareness of the importance of vaccinations is everyone’s business: evidence demonstrates that a range of interventions and partnership working can have a positive impact on increasing uptake rates (5). Therefore, it is crucial that partners from across the health, education and social care system work collaboratively to support parents to access the vaccination programme and to challenge any myths. A screening programme is like a sieve, it sifts through a healthy population to detect those that are more likely to have the condition/disease in question. Those that are more likely to have the disease i.e. are at higher risk, will go on to have a more definitive test – a diagnostic test, to determine whether they have the disease. The UK National Screening Committee (UK NSC) advises Ministers and the NHS about all aspects of screening policy and supports implementation. Using research evidence, pilot programmes and economic evaluation, it assesses the evidence for programmes against a set of internationally recognised criteria to ensure screening does more good than harm. Prevention and early detection is important to reduce deaths from cancer including: behaviour modification of lifestyle factors (smoking, diet, exercise and alcohol); increasing awareness of the early signs and symptoms of cancer; and encouraging participation in the National Cancer Screening Programmes. Cancer screening programmes are free at the point of use and available to anyone in the target age groups, irrespective of gender, income and disability. Evidence suggests that, together they identify approximately 6% of all cancers (11); early enough in most cases (63%) to make a difference to the effectiveness of treatment and improve survival (also diagnosing patients earlier costs the NHS less) (12). Non cancer screening programmes have been shown to reduce mortality, for example in the case of abdominal aortic aneurysms (AAA). AAA usually cause no symptoms, but if the aneurysm ruptures it can be fatal. Around 8 out of 10 people with a ruptured AAA either die before they reach hospital or don’t survive surgery. AAA screening identifies abdominal aortic aneurysms early, enabling them to be monitored or surgically repaired which can reduce the rate of premature death by nearly 50%. There are around 2.9 million people with diabetes mellitus in England. Diabetic retinopathy is a complication of diabetes caused by high blood sugar levels damaging the back of the eye (retina). Diabetic retinopathy can be asymptomatic in the early stages, and over time can cause blindness if left undiagnosed and untreated. It is one of the most common causes of sight loss among people of a working age. Diabetic retinopathy screening enables this disease to be promptly identified and treated, reducing the risk of sight problems or subsequent blindness. In addition, there are a number of screening programmes offered in the antenatal period, and to new born babies, to detect conditions such as Down’s syndrome, or specific problems such as infant deafness. Since the introduction of the childhood immunisation programme, levels of vaccine preventable infections in the UK have decreased significantly. The routine immunisation programme for the UK includes those immunisations recommended by WHO as well as a number of others as defined by Public Health England (PHE) in ‘Immunisation against infectious diseases – the Green Book’ (6). There are a range of different immunisations for different population groups dependent on their age and needs. Furthermore, in addition to the routine immunisation programme, there are a number of non-routine (selective) vaccinations for children and adults identified to be at higher risk of catching and/or the complications of certain diseases. For example, babies born to mothers who are positive to hepatitis B infection, infants born in areas of high prevalence of tuberculosis and pregnant women. The current schedule and further details on the national immunisation programme, which is continuously reviewed and updated, can be found at: https://www.gov.uk/government/organisations/public-health-england/series/immunisation and specific information on each vaccine preventable infection covered by the national immunisation programme can be found in the relevant chapters of the ‘Green Book’ (6). Cancer is a term that is used to refer to a number of conditions where the body’s cells begin to grow and reproduce in an uncontrollable way. There are many different types of cancer. The most common cancers in the UK (by number of new cases) are breast, lung, prostate, and bowel. Certain risk factors are known to increase the chance for one or more body cells becoming abnormal and leading to cancer. As the population ages, cancer incidence rates in the UK will continue to rise. More than a third of cancers are diagnosed in people aged 75 and over (36% in the UK in 2009-2011) (13). Some ethnic groups have higher incidence rates of some cancer types compared to the White ethnic group. For example, people from the Black ethnic group have higher rates of myeloma and stomach cancer and males from the Black ethnic group have higher rates of prostate cancer. Liver cancer is higher amongst people from the Asian ethnic group compared to the White ethnic group, as is mouth cancer in women and cervical cancer in the over 65s (13). Prostate cancer, with an age-standardised (AS) incidence rate of 105 per 100,000 men, accounts for one in four (25%) cases of cancer in men. (Age-standardisation adjusts rates to take into account how many old or young people are in the population being looked at. When rates are age-standardised, you know that differences in the rates over time or between geographical areas do not simply reflect variations in the age structure of the populations.) The next most common cancers are lung (14%; even though the rate of lung cancer has fallen almost continuously since the early-1980s) and bowel (14%). These three cancers together account for over half (53%) of all new cancer cases in men in the UK. Breast cancer, with an AS incidence rate of 125 per 100,000 women, is by far the most common cancer in women, accounting for almost a third (30%) of all cases in women. The next most common cancers in women are lung and bowel, each accounting for similar proportions of cases (12% and 11%, respectively). Breast, lung and bowel cancers together account for over half (53%) of all new cases in women in the UK. Inequalities in cancer incidence in relation to socio-economic deprivation are one of the major concerns as it is known that risk factors for cancer, especially smoking, are strongly influenced by socio-economic determinants. The relationship between deprivation and cancer is complex and multifaceted. Certain types of cancer – such as lung, mouth and oesophagus – are more likely to be diagnosed in the most deprived groups. For other types of cancer – such as breast and prostate – death rates are higher among the most deprived despite the fact that incidence rates are lower (14, 15, 16, 20). Cancer mortality rates are higher for deprived groups. Unskilled workers are twice as likely to die from cancer as professionals, and while mortality rates vary widely across the country, they tend to be highest in areas with significant levels of deprivation. Much of these inequalities relate to higher smoking prevalence among the most deprived populations which leads to a greater incidence of smoking related diseases, including cancer. Risk factors for AAA include those that cannot be modified such as being male, family history of AAA and age. While risk factors that can be modified include smoking, atherosclerosis by improving diet, and high blood pressure. Reducing the risk of developing diabetic retinopathy can be performed by: controlling blood sugar/pressure and cholesterol levels; taking diabetes medication as prescribed; attending all diabetic eye screening appointments; obtaining ophthalmological advice quickly if vision suddenly changes; maintaining a healthy weight, by eating a healthy, balanced diet and exercising regularly; and stopping smoking. Risk factors for the problems identified through antenatal and newborn screening include family history, genetic factors, ethnicity, age of mother and infectious disease during pregnancy. As mentioned above, the European Region of the WHO has set a 95% uptake rate for childhood immunisations. Currently, Surrey falls below this and the national (England) benchmark in relation to cover rates for most childhood immunisations (7). Further discussion about local challenges and recommendations around how to improve rates is provided at a later stage of this chapter, and trend data is provided on the Immunisation and Screening dashboard, however, current uptake rates for Surrey as a whole are listed below. The DTaP/IPV/Hib or ‘5-in-1’ vaccine provides protection against five serious childhood diseases. In Surrey during 2015-16, an average of 82.4% of children received their initial DTap/IPV/Hib by their first birthday, compared to 93.5% in England. The PCV vaccine protects against certain types of pneumococcal infection. During 2015-16, an average of 84.5% of children received their initial PCV by their first birthday, compared to 93.5% in England. MMR is a safe and effective combined vaccine that protects against three separate illnesses – measles, mumps and rubella – in a single injection. The full course of MMR vaccination requires two doses. During 2015/16, within Surrey, 82.5% of children have had their first MMR, with 73.8% receiving the 2nd dose MMR. In England the figure is 91.7% and 88% respectively. Children also receive a DTaP/IPV pre-school booster prior to starting school, and in Surrey 71.5% of five year olds have had this booster compared with the national figure of 87.4%. Meningococcal disease is caused by invasive infection with the bacterium Neisseria meningitidis, also known as meningococcus. Meningococcal disease can affect all age groups, but the rates of disease are highest in children under two years of age. Prior to the introduction of the Men B vaccine, Meningococcal B disease accounted for 80% of laboratory confirmed cases of meningococcal disease. The vaccination programme was introduced in September 2015, and the Joint Committee on Vaccinations and Immunisations (JCVI) recommended a two dose primary course of vaccination. A recent Lancet study has shown that the ‘two-dose infant schedule was found to be 83% effective against all Men B cases, irrespective of whether the responsible Men B strain was preventable by the vaccine.’ (8). In Surrey and Sussex, average Men B vaccination uptake for the first six months of 2016 for dose 1 was 94.9%, and 88.3% for the second dose. The Hib/Men C vaccine is a single injection given to one-year-old babies to boost their protection against Haemophilus influenzae type b (Hib) and meningococcal C. Hib and meningococcal C infections are serious and potentially fatal. They can both cause meningitis and septicaemia. Average uptake for the Hib/MenC vaccine in Surrey for 2015/16 is 81.6% – this figure is considerably lower than the annual Hib/Men C vaccine uptake for England in for the same time period, which was 91.6%. An oral vaccine against rotavirus infection, a common cause of diarrhoea and sickness, is given as two doses for babies aged 8 and 12 weeks, alongside their other routine childhood vaccinations. Data across Surrey CCGs demonstrates a high level of uptake for the first dose, with average uptake ranging between 93% in Surrey Downs CCG and 97% in Guildford and Waverley CCG. However, uptake rates do appear to decrease for the second dose, with figures ranging from 87% in Surrey Downs CCG to 92.8% in East Surrey CCG. The human papillomavirus (HPV) national childhood vaccination programme was introduced in 2008 for secondary school Year 8 girls (12 to 13 years of age) as a three-dose schedule given within a six-month period. From 2014 the schedule has changed to two doses, given at least six months apart. In Surrey, there are three main providers of the HPV vaccination programme, First Community Health and Care (FCHC), Central Surrey Health (CSH) and Virgin Care. Percentage uptake of the HPV vaccine for dose one is 85.7% for 2015/16. As per Green Book guidance, HPV doses can be given 6-24 months apart allowing some flexibility in delivery of the programme by community providers. As such data for the second dose during the period 2015/16 is currently unavailable. Since 2009 there has been a year on year increase in the number of cases of meningococcal W (MenW) disease. Older teenagers and young adults are more at risk of getting meningitis and septicaemia from MenW. A catch-up programme offering a MenACWY vaccination to all 14 to 18 year olds and new university entrants started from August 2015. Men ACWY protects against four groups of meningococcal bacteria that commonly cause disease, meningococcal (Men) A, C, W and Y.
Uptake of the MenACWY programme via the school based delivery model for the academic year 2015/16 is shown in the table below. The MenACWY vaccine is also provided through primary care via a locally enhanced service to older children and young people. must be operated. Call/recall is a systematic method of inviting eligible populations for immunisations as per the Green Book, and are managed in partnership between Child Health Information Systems and individual GP practices. Where initial invitations are not taken up, further attempts must be made to re-invite patients for immunisations as per local arrangements). However, data highlights that uptake of the vaccine for these age groups is low, with CCGs only achieving uptake of between 25% and 42%. Children in year 10 are also offered the tetanus and polio booster alongside the MenACWY booster, with children who miss this being offered the vaccination in a community setting. From October 2016, children in years one, two and three have been invited to take part in the national childhood flu vaccination programme. Children may become unwell with the flu virus but can also spread the virus to many vulnerable people. A 40% minimum uptake of the childhood flu programme is expected in order to be effective in both protecting children, and in order to prevent the onward transmission of the virus. In 2015, over 60% of the eligible children in Surrey schools were vaccinated, although the rates for preschool children aged 2, 3 and 4 were much lower – between 30% and 43% depending on CCG. As noted above, there are several immunisation programmes targeted at adults in specific population groups, such as the over 65s and those in clinical ‘at risk’ groups. Influenza is an acute viral infection of the respiratory tract. For the otherwise healthy, flu is usually self-limiting within a week but can be easily transmitted to others. Serious illness can result from influenza in children under six, older people, pregnant women and people with chronic underlying health conditions such as Chronic Obstructive Pulmonary Disease (COPD). These groups are at a greater risk of developing more serious complications from flu, such as bronchitis, pneumonia or cardiac problems. On an annual basis, Public Health England sets out a Flu Plan with an evidence based approach to responding to flu pressures. As part of the annual flu plan, high risk groups such as the over 65s, people with long term conditions or those with weakened immune systems, pregnant women and carers are vaccinated in an effort to protect them from flu and also to prevent transmission to those at risk of complications. A 75% target of flu vaccination uptake is expected in frontline healthcare workers – however, national uptake figures among staff members are historically low. In Surrey, Provider Trusts had a rate of vaccination for their frontline workers of between 10% and nearly 50%, and GP practices achieved between 43% and 70% for their staff. Target rates for flu vaccination uptake are 75% for over 65s, and at least 55% for all other at risk groups. The table below shows uptake by CCG for the key groups for 2015/16 flu season. Pneumococcal Polysaccharide Vaccine (PPV) is offered to all persons aged 65 and over as a single injection. PPV protects against serious and potentially fatal pneumococcal infections. It is also known as the “pneumo jab” or pneumonia vaccine. Vaccine uptake across Surrey CCGs ranges between 64.1% in Surrey Downs and 75.6% in Surrey Heath. The shingles vaccine is a single injection which aims to boost the immunity against the chickenpox virus which lies dormant in the nervous system after earlier infection. It is currently offered to people aged 70 and 78 years old. Uptake of the shingles vaccine in Surrey since 2013 for the routine and catch up cohorts (70 years and 78 years respectively) ranges from 45.7% in East Surrey CCG to 56.2% in Surrey Heath CCG (70 year olds) and 47.6% in East Surrey CCG to 59% in Surrey Heath CCG (78 year olds). Pertussis, also known as whooping cough, is a respiratory infection and usually begins with mild, cold-like symptoms which develop over one to two weeks into coughing fits which can be severe. Preventable neonatal deaths and avoidable admissions to acute paediatric units with pertussis infections still continue to be reported nationally. In February 2016, the JCVI reviewed new evidence indicating that high levels of maternal antibody are transferred to the infant, even if women are vaccinated earlier in pregnancy (9). Therefore from 1 April 2016 it was recommended that pregnant women should be offered a single dose of dTap/IPV vaccine between gestational weeks 16 and 32 in every pregnancy. JCVI advised that this was the optimal period when vaccination would maximise the protection of the baby from birth. Uptake of the pertussis vaccine by CCG varies between 62% and 72%, which is slightly higher than the regional average (Surrey and Sussex) of 62.9%. In Surrey, based on GP registers for the period 2013/13, the prevalence of cancer was 2.2% compared to a national average of 1.9%, although Surrey has a statistically significant lower mortality rate from all cancers combined than England (246/100,000 compared with 279.4/100,000). Survival after diagnosis is commonly measured at 1 and 5 years and in Surrey the 1 and 5 years relative survival rate (% of patients) for breast, bowel, lung and prostate cancers are higher than the national average. Survival after diagnosis is commonly measured at 1 and 5 years. Nationally, the relative five-year survival rate is over 80% for breast and prostate cancer, around 15% for brain cancer and around 10% for lung cancer. One in five people with lung cancer die within just one month of diagnosis and are more than 10 times as likely to die within a month of diagnosis as those with breast cancer. Because of the time lag with survival figures, data are only available on old boundaries, i.e. for Surrey Primary Care Trust and Surrey, West Sussex and Hampshire (SWSH) Cancer Network. For breast and lung cancers, Surrey PCT and SWSH Cancer Network had higher 1 year (2008-2010) and 5 year (2004-2006) relative survival rates. For the SWSH Cancer Network, prostate one year survival was lower than England. The mortality rate from all cancers combined per 100,000 population is significantly lower in Surrey (246/100,000) than the national rate (279.4/100,000). Lung cancer is the 5th most common cancer in Surrey and has the highest mortality rate. Bowel cancer screening is offered to men and women aged 60 to 74 (inclusive). Bowel scope cancer screening is offered to men and women aged 55 (this is currently being rolled out Surrey wide). Cervical screening is offered to women aged 25 to 64 years. Screening coverage and uptake are measures used to assess the performance of screening programmes. Coverage is defined as the percentage of people resident and eligible for screening at a particular point in time who had a test with a recorded result at least once within the previous two, three or five years depending on their age and the screening programme. Uptake is defined as the percentage of people who, after being invited for screening in a time period, responded to the invitation and were adequately screened within a certain time limit. Across Surrey, average coverage and uptake rates in the three national cancer screening programmes (breast, bowel and cervical) vary and in some cases fall short of national targets, as shown in the table below. Therefore, there is a need to: improve the coverage of breast and cervical cancer screening programmes locally; ensure services provide patients with greater awareness of the signs and symptoms of cancer so they present earlier; and improve timely diagnosis through early referral from primary care. Diabetic retinopathy is the most common cause of blindness in patients of working age in the UK. The risk of developing retinopathy can be reduced by good management and control of diabetes (glycaemia control) and blood pressure. The NHS Diabetic Eye Screening Programme (NDESP) aims to reduce the risk of sight loss among people with diabetes by the early detection and treatment, if needed, of sight-threatening retinopathy. 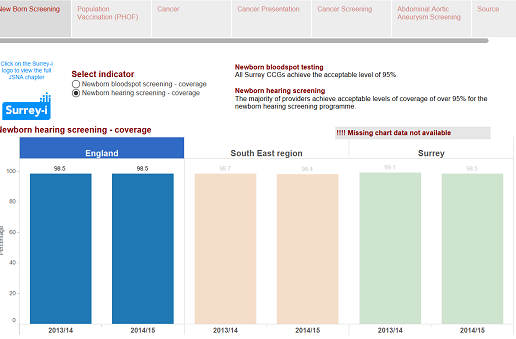 Currently, the Surrey provider achieves well above ‘acceptable’ levels of coverage of the initial screen and also above the ‘achievable’ target of 80%. It should be noted that the proportion of patients referred with retinopathy who received consultation within four weeks of a positive test fell short of the target in Q2 and Q3; however, this increased to 94.4% in Q4. The NHS Abdominal Aortic Aneurysm (AAA) screening programme is available for all men aged 65 and over in England. The programme aims to reduce AAA related mortality among men aged 65 to 74. The proportion of men eligible for abdominal aortic aneurysm screening who receive an initial offer of screening was 99.9% for West Surrey and 97.1% for East Surrey. Screening for infectious diseases in pregnancy – between weeks eight and 12 of pregnancy early screening for Rubella susceptibility, HIV, Hepatitis B and Syphilis is recommended. 90% Surrey services achieve over the national target of 90% coverage, with the exception of timely referrals of pregnant women with hepatitis b for specialist assessment which has been problematic but changes to the referral pathway is addressing this. Fetal anomaly ultrasound screening – dating scans should take place after eight weeks and before 14 weeks. Anomaly scans should take place between 18 and 20 weeks six days. 97% Acceptable level of 97% is generally achieved, however, figures have slightly declined for two providers during Q3 and Q4 to around 96%. Newborn hearing – screening undertaken from birth to five weeks of age. 95% The majority of providers achieve acceptable levels of coverage of over 95%, with the exception of one provider during Q3 2015, where levels fell short of this. Newborn and infant physical examination (NIPE) – the first physical examination is performed within 72 hours of birth, the second physical examination is done at 6-8 weeks of age. 95.0% The majority of providers achieve acceptable levels of coverage of over 95%, with the exception of one provider during Q3 2015, where levels fell short of this. Newborn blood spot – the blood spot is taken between day five and eight (birth is day 0). Blood spot is currently screened for PKU (phenylketonunia), CHT (congenital hypothyroidism), sickle cell disease/thalassemia, cystic fibrosis and medium chain acyl dehydrogenase deficiency (MCADD). 95% All Surrey CCGs achieve the acceptable level of 95%. As mentioned previously, the immunisation programme in Surrey is commissioned by NHS England, with operational and delivery support provided by a specialist Screening and Immunisation team employed by Public Health England (PHE). Childhood population immunity from the NHS immunisation programme is measured routinely through COVER reports (Coverage of Vaccination Evaluated Rapidly). These reports are produced every quarter and now give percentage immunisation coverage or uptake for each upper tier and unitary local authority area. COVER data is published by NHS Digital (previously Health and Social Care Information Centre) for children reaching their 1st, 2nd and 5th birthdays. Currently across Surrey, routine vaccinations are primarily delivered via general practice, and routine school-aged vaccinations are delivered by specialist community immunisation provider teams using a school-based model. In addition, providers offer vaccination clinics inviting those children who have missed the school based programme to maximise uptake and ensure a 100% offer to all children inclusive of those attending independent schools, special needs schools and the home schooled cohort. From April 2017, routine school-aged vaccinations, community based vaccination clinics targeting those children with missed or uncertain immunisation status, and domiciliary visits will be provided by a single community provider. Liquid Based Cytology (LBC) and HPV testing. Direct referral for colposcopy rolled out to women requiring treatment. A leading quality service nationally with innovative practices. Age extension randomised trial established for women aged 47-49 and 71-73. Bowel cancer/colorectal screening Screening commenced in September 2008. Age extension established for men and women aged 70-74 years. Bowelscope screening Screening commenced in Surrey in 2013 as a pilot site. This is being rolled out to the Surrey population in a phased approach. Diabetic Eye Screening (DES) Programme operational. The eligible population for DES is all people with type 1 and type 2 diabetes aged 12 or over. People already under the care of an ophthalmology specialist for the condition are not invited for screening. Offers screening for pregnant women from 10+0 up to 20+6 weeks of their pregnancy to check the baby for fetal anomalies, Down’s, Edwards’ and Patau’s syndromes. Newborn blood spot screening (NBBS), The NHS NBS Programme aims to identify newborn babies at high risk of sickle cell disease (SCD), cystic fibrosis (CF), congenital hypothyroidism (CHT) and six inherited metabolic diseases: phenylketonuria (PKU), medium-chain acyl-CoA dehydrogenase deficiency (MCADD), maple syrup urine disease (MSUD), isovaleric acidaemia (IVA), glutaric aciduria type 1 (GA1) and homocystinuria (pyridoxine unresponsive) (HCU) to improve health and reduce disability or death. Midwives carry out heel prick tests when babies are 5 days old (the first day of life being day 0). Babies who move into the area and those over 28 days and under 1 year are also offered the NBSS. The NHS newborn hearing screening programme (NHSP) aims to identify moderate, severe and profound deafness and hearing impairment in newborn babies by screening babies within 4-5 weeks of birth and before 3 months. The 6 to 8 week screen is necessary as some conditions appear later in a child’s development. Surrey is currently rolling out implementation of the NIPE SMaRT failsafe reporting software, RSCH will go live in 2017. Abdominal Aortic Aneurysm (AAA) Screening Established April 2012. The NHS abdominal aortic aneurysm (AAA) screening programme is available for all men aged 65 and over in England. As noted, immunisation rates in Surrey for most childhood immunisations fall short of the recommended target of 95% and also national uptake rates. This is likely to be due to a range of issues as outlined below. A review of data collected from GP payments indicated that the level of immunisation in Surrey may be higher than statistics collected by the COVER system and reported nationally. In order to investigate further, NHS England decided to commission a company, Health Intelligence, to automate the data transfer process between primary care and the Child Health Information System. This was following a similar project which had significantly improved uptake in parts of London. We are only now beginning to see modest improvements in the COVER data. Although 85% of Surrey practices signed up to participate in the project, the COVER data has remained persistently low, even though Health Intelligence’s own database suggests it should be higher. A project group, involving Health Intelligence, Child Health Intelligence Service (CHIS) and the national COVER team is trying to resolve this anomaly. The project did result in freeing up time for CHIS administrative staff, and this might have allowed improved data cleansing. Further efforts could be made to improve the way CHIS is used to maximise immunisation rates, but this might have cost implications. For example, enhanced staffing in CHIS could allow for a more proactive approach to ensuring database accuracy, and the use of the CHIS data to generate alternative additional approaches to children (e.g. sending birthday cards with an immunisation reminder to unimmunised children). At present, there is no consistent mechanism for the follow up of unimmunised children in Surrey. In the first instance, work needs to be completed in order to proactively identify children who are not up to date with all immunisations due by ages 6, 15 and 48 months in order to provide practices with an opportunity to immunise prior to COVER report submission. This is being actioned in 2016/17 as part of a CQUIN – a performance improvement programme within the CHIS contract. Anecdotal feedback suggests that local GP practices have sent postal invitations but that uptake following receipt has been limited. NICE guidance recommends phoning or texting as accessible ways to contact families of unimmunised children, therefore efforts should be taken to explore ways with primary care colleagues in which these methods can be implemented locally. To date, representation from CCGs at the Surrey Immunisation and Vaccination Committee has been limited, however, work continues between the Screening and Immunisations Team and CCGs across Surrey to determine the most appropriate level of representation. The NHS reforms initiated with the Health and Social Care Act 2012 introduced some key changes to the way screening services are commissioned and delivered. Over the last few years there has been a move from the use of analogue to digital mammography. Digital mammography has been shown to be more sensitive and specific for pre-menopausal women who have denser breasts. Digital images can also be exchanged electronically between radiologists at different hospitals to discuss complex cases. Nationally and locally there has been a recent decline in screening uptake which could be a sign that the “Jade Goody” effect, which resulted in a sharp increase in screening following her high profile death, may be wearing off. Testing for HPV (Human Papillomavirus) infection in women with low grade abnormalities is in place and it is expected that primary HPV testing will be introduced in 2018/19. The bowel screening programme (FOBt) covers ages 60-74 with an uptake rate of 58.1% in Surrey. There are plans to change the test to Faecal Immunochemical Testing (FIT) in 2018 and it is anticipated that this may improve uptake between 8-10%, as seen in trials so far. Bowel Scope screening (flexisigmoidoscopy) has been on a phased rollout since 2013, when Surrey was one of six sites to pilot the programme. This has since become a national programme and the rollout continues however it has taken longer than anticipated due to some challenges. The key challenges for the bowel programmes are increasing workload, staff recruitment, quality assurance and accreditation. The screening programme has made good progress in addressing the recommendations of the External Quality Assurance Visit in February 2015 (report was issued 7th May 2015). . There will be a new DESP provider, EMIS Care from April 2017. There is a national issue with regards todata reconciliation – a national solution ‘GP2DRS’ is in progress but roll out of this is still some time away. Much of this screening has been taking place for many years, but has not had the detailed information collection and quality assurance associated with other screening programmes. This is now changing, however for some of the programmes, the data collection still requires further improvement. There is a wealth of evidence to suggest that a range of multidisciplinary and flexible approaches are effective in improving uptake of immunisations. In September 2009, the National Institute for Health and Clinical Excellence (NICE) (5) published public health guidance which focused on increasing immunisation uptake among children and young people aged under 19 years in groups and settings where immunisation coverage is low. Provide flexible immunisation programmes that involve a range of key frontline stakeholders in order to ensure parents and young people are; provided with (or know how to access) information, advice and guidance around immunisations; are offered vaccination opportunistically by appropriately trained health professionals; or are signposted effectively. Ensure the implementation of structured and systematic information systems which record and maintain information on the vaccination status of all children and young people consistently across patient records, payment and child health systems in order to ensure that children and young people are sent tailored invites and/or recalled in a timely fashion. Ensure all staff involved in immunisation services are appropriately trained. Training should be regularly updated. It should be tailored to individual needs to ensure staff have the necessary skills and knowledge, for example, communications skills and the ability to answer questions about different vaccinations. Embed a whole systems approach to improving uptake – for example, health visitors, school nurses, children’s centre staff, prisons services, voluntary sector etc could play a pivotal role in explaining the importance of vaccinations to parents and young people, challenging myths, signposting effectively, and where appropriate, offering opportunistic vaccination. Consider using pharmacies, retail outlets, libraries and local community venues to promote and disseminate accurate, up to date information on the benefits of childhood immunisation. Improve access to immunisation services for those with transport, language or communication difficulties and those with physical or learning disabilities. For example, provide longer appointment times, walk-in vaccination clinics, services offering extended hours and mobile or outreach services. The latter might include home visits or vaccinations at children’s centres. Identifying and targeting ‘under-served’ population groups, such as travellers, clinical at risk groups, looked after children and children with disabilities. Explore and embed methods of increasing uptake via Surrey County Council commissioned services such as health visitors, school nurses and Children’s Centres. There is also scope to encourage professionals such as nursery nurses to promote immunisations at rhyme time sessions at local libraries. The opportunity to discuss immunisation status should also be maximised as part of Making Every Contact Count with referral to GP or Specialist Immunisation Team for any that are missed or status is uncertain. Obtain print campaign material from national team for dissemination to children’s centres, walk-in-centres, GPs. Support and promote immunisation campaign, in particular assisting practices to identify unimmunised children and young people. Write to parents to invite children who have missing immunisations either directing them to their GP practice or directly providing and follow up service in another identified clinical setting that provides increased access and flexibility within the community. At school entry points, for example Reception and Year 7, school nurses should be encouraged to check immunisation status and ensure timely referral is made to GP surgeries if children are found to be missing any routine childhood immunisations. Antenatal and newborn – IT tracking systems to ensure that all women booked for antenatal care receive their screening in accordance with the national standards – currently maternity, lab and community services cannot electronically share information easily. John T J, Samuel R (2000). “Herd immunity and herd effect: new insights and definitions”. Eur.J.Epidemiol. 16 (7): 601-6. Parkin, D.M., L. Boyd, and L.C. Walker, The fraction of cancer attributable to lifestyle and environmental factors in the UK in 2010. Br J Cancer, 2011. 105 Suppl 2: p. S77-81. Lyratzopoulos, G., et al., Socio-demographic inequalities in stage of cancer diagnosis: evidence from patients with female breast, lung, colon, rectal, prostate, renal, bladder, melanoma, ovarian and endometrial cancer. Annals of Oncology, 2013. 24(3): p. 843-850.